I want to talk for a minute about trailers. I have a friend who is the biggest movie buff I know. He’ll tell you, at length, his opinion on trailers: that they are, on their own, an art form of sorts. I’ve spent evenings at his apartment just watching trailers from his DVD collection while he talks point by point about why this trailer worked or that one didn’t. A trailer is, of course, a game’s real first impression, considering they predate release by months or years. The trailer is the first chance to tell everyone, if you buy this game, this is what you’ll get. A good trailer can make a game that doesn’t even quite exist yet incredibly exciting. 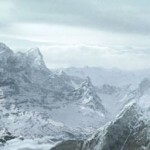 I assert the following: the cinematic trailer for Fall of Cybertron had a very good trailer. I won’t go on and on about the fanboyish, nostalgic glee that this trailer elicits every time I see it, or how, somehow, it manages strangely profound characterization for more than one character in it (although maybe that’s years of reading Transformers comics talking: I am very conditioned to see Optimus Prime as a tragic hero). Puscifier’s “The Humble River” is maybe not a song I would’ve immediately linked with this property, but does it ever work. And yet, in the case of Fall of Cybertron, the game turns out to be possibly more awesome than even that trailer suggests. Yes, all those classic characters are featured in the game, and rather than being fairly minor cameos, most play substantive roles. Yes, there are even levels – levels! – wherein you get to play as the Decepticon combiner, Bruticus. 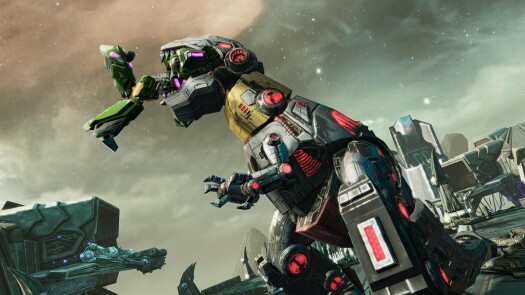 Yes, the Dinobots are in it, and you get to play as Grimlock. More astonishing still, all of these things work, and they each work in their own way. 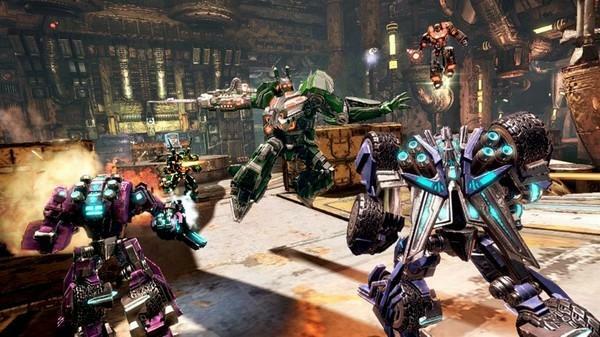 Where High Moon’s previous Transformers game, War for Cybertron, fell short of making each character – or even each level – feel terribly different from each other, Fall of Cybertron revels in variety. Some characters still play similarly – vehicle modes notwithstanding – but that makes a degree of sense, but now the characters’ special abilities are not based on class but, well, character, so Cliffjumper and Jazz – both Infiltrator class Autobots – have very different level design to make maximum use of their abilities. Cliffjumper, who has an experimental invisibility cloak, features in a stealth-heavy level, and Jazz, who comes equipped with a grapple beam not unlike Samus Aran’s, finesses his way through a highly vertical level no other character could handle. Those characters who do end up feeling most generic – say, Swindle, one of the Combaticons, or even Prime – get levels that do a lot of the work, throwing them into a big, well-executed set piece (or, you know, giving them the special ability of calling Autobot City itself, Metroplex, to come stomp some Decepti-creeps). Characters like Bruticus and Grimlock play very differently, which makes their levels a real treat, but they aren’t overused. Grimlock towers above other ‘bots, uses a sword (complete with slightly-mashy combat and execution moves) instead of some kind of ranged weapon, and cannot change to his T-rex form at will; instead, that’s his special ability, and boy, is it ever special. If ever a game managed to convey the amount of awesome that being a giant, robotic, fire-breathing T-rex must obviously be, it’s Fall of Cybertron. Fall of Cybertron is a game of pretty average length for its genre, but in that 6-10 hours of campaign a whole lot happens. 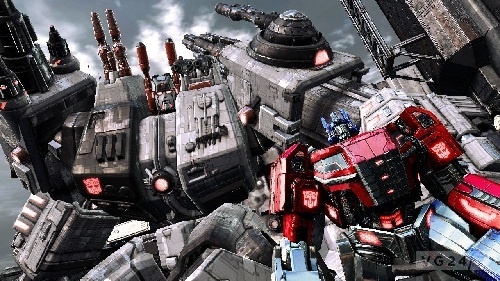 Most third person action games feel like they’ve been padded with lots of extra gameplay, and War for Cybertron was a principle offender; Fall of Cybertron rarely, if ever, feels that way. I never found myself thinking, “Ugh, another firefight?” There always seemed to be something new getting thrown at me, whether a new character with his own nuances, or a new plot thread, and no level feels like it is just there to fill time. Every one has a clear function in the game’s story, which is pretty good in itself, and really feels like three or four different stories, but in the best way. Trophy hunters will find incentive to replay the excellent campaign to find all the hidden weapon blueprints and audio diaries, as well as purchase all the weapon upgrades from Teletraan 1. Which is all to say, if you’re craving a good action game, this is one of the best to come out for months. Fall of Cybertron exists in a take on the Transformers universe somewhere between the old school “Generation 1” stuff that I grew up with and the live action continuity of the Michael Bay films, and keeps more or less the best parts of each incarnation. Fans of the classic stuff will, as is usual with Transformers properties, be able to catch numerous quotes and homages to the original cartoon, especially Transformers: The Movie from 1986, and that makes me happy. But if you aren’t one of those people, you can get by without even playing War for Cybertron: its plot points are mildly relevant, but not so much that you’ll be lost. Fall of Cybertron‘s main plot is established pretty much up front: the Autobots have built their Ark to carry them away from Cybertron, which has been pretty much overrun by the Decepticons, but Megatron is a spiteful sort and can’t accept Prime escaping his grasp. 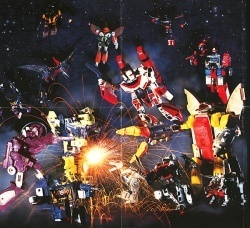 By the end (a big final level that sees the player swapping between several different characters as the Decepticons attack the Ark in flight, a big-budget version of the original origin story from the cartoon) the plot includes dozens of classic characters (or versions of them), including the usual mainstays as well as the Dinobots and Insecticons. This, along with the current CG-animated cartoon series Transformers Prime, which occupies the same continuity, is an excellent example of how to do a Transformers story with appeal to fans old and new. 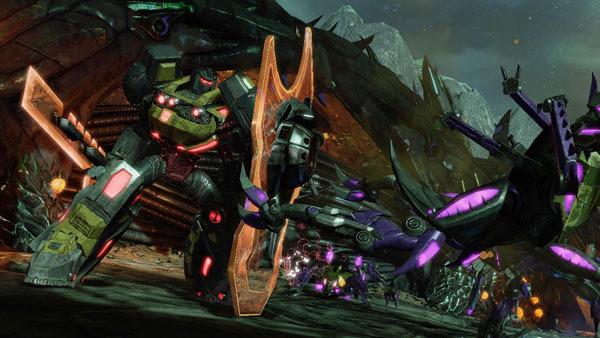 The multiplayer, which was a surprisingly strong point of War for Cybertron, remains largely intact here, with a handful of standard multiplayer game modes to choose from (livened up a bit by the ability to transform into whatever alt mode you’ve chosen for you character) as well as the 15-wave Escalation survival mode. None of this is groundbreaking, but it is definitely worth a bit of play time when you’ve finished the campaign. Dare to believe you can survive! The “create a character” features have gotten much stronger. Once again you have four classes to choose from in each match – the buff/debuffer Scientist, which can fly in alt mode; the quick, lightly armored Infiltrator; the all-around soldier, the Destroyer; and the towering, tank-mode-having Titan – and as you level each class you get the ability to make several different builds and choose from a wider array of weapons and special abilities. All classes seem quite balanced, with their own strengths and weaknesses, and you’ll never know quite what combination of classes you’ll see in a game (though some classes are certainly more suited to certain game modes). The avatar creation aspect, which has no mechanical effect, is far more intriguing, allowing you to pick individual body parts from dozens of options, including some that you’ll recognize from classic Transformers characters who don’t appear anywhere else in the game. Note pieces of Ultra Magnus, no doubt salvaged from the planet of Junk. This is not a shockingly innovative title, and given that there’s an oft-deserved stigma against games based on non-game IP, it’s easy to overlook. But this is a superb example of just building a really competent, entertaining game, making superb use of a challenging IP, and just all-around delivering. As a Transformers fan – as a gamer – I wish there were more titles that lived up to that standard. E-mail the author at dix@tap-repeatedly.com! Woo! I’m a big Transformers fan, so, I’m happy to hear this one lives up to the hype. Just have to clear out some schedule to play it. I’ll disagree a little with one thing, though. I didn’t really feel like the song in that trailer “worked.” It felt like yet another entry in the ‘let’s play sad music while high-octane cartoon action happens to give it weight’ trailer genre (see also Halo, Gears of War). They do give an explanation for the Dinobots being based on Earth dinosaurs, yes. I advise you don’t delve too far into the continuity of this…er…continuity, though, since apparently the (Hasbro?) decision to put War for Cybertron/Fall of Cybertron in continuity with Transformers Prime creates a few peculiarities when you think about it too hard. Or…at all. Transformers were extremely important to my formative years so I generally steer clear of any reboots, regurgitations and, god forbid, Michael Bay films. Still, you manage to sell this a little – and even RPS had some nice words to say about it – so I guess I’m a little tempted (well, if I didn’t have backlog of games the size of Unicron’s planet-devouring maw to play already). You praised this game highly while we were recording the WTNW podcast, Dix, and piqued my attention. I don’t think I’ve ever actually played a Transformers game – as you say, that stigma of licensed IP is hard to get past. But I’m intrigued. Finding a really nice, solid, competent, fun game is always a treat. There’s something to be said for games that just do it good, games like Human Revolution and, apparently, Fall of Cybertron. We may not remember them for years like we do the very best (or the very worst), but trusty, workmanlike games are the strong foundation upon which our other, more extreme experiences should rest. Yes, I imagine there lies madness. Well, to be sure, it’s probably easier to reconcile the continuity family here than it is, say, the G1 stuff, because animation errors alone make that freaking impossible. From what I can tell, the “Aligned” continuity to which Fall belongs was structured somewhat after the fact by Hasbro, so even though War for Cybertron is included, the developers didn’t know that at the time. On the bright side, it’s no All Hail Megatron. I haven’t gotten this yet, and hope to at the end of Sept, or maybe early Oct… I was a huge fan of the original, and I’m looking forward to this. If only High Moon would make the multi-player stuff accessible for a single player. Would it be so hard to have AIs running around multi-player maps, for those times when none of your friends are online, or just when you want to jump into some mindless violence without being on the interwebs? Anyway, good review man, still looking forward to getting the game. I know bugger all about Transformers but that’s some high praise Dix! Great review, and if time and my backlog permits I may very well check it out. Speaking of backlogs, where has the Log of Shame got to?